As a fellow Brightonian, I squeezed a pre copy with this book coming from a book signing after listening to this amazing endeavour, and I’m so pleased I did. Written in the informal, diary type style, the publication follows the article author as he walks round the coast of England. As he walks, his thoughts drift time for his childhood (amongst other items) also it makes for important reading. After most days, Dave may have reached a clear place then there is often a short excerpt with that particular place as well as history. In my opinion this really adds to it as it’s interesting to discover some local info about certain places returning through history. If you don’t desire to read about Scarborough within the 10th century though, you’ll be able to just skip to your walking parts! Dave with his fantastic son Rob (the support driver) lost the battle such a long time (and money) to accomplish this walk, therefore nothing else they deserve a great deal of credit for the! The camper van fuel, the campsite fees, the foodstuff & drinks everyday… all of it adds up I’m sure. Anyway, if you want real-life type books that happen to be inspiring and fairly personal next the will be a good read… when I’d finished I already begun to wonder ‘why haven’t I done anything in this way before?’! The author can be really into positive thinking and good well-being and it has his ideas for exercise through walking. This is just another added bonus to the ebook that I’m sure a great deal of people will discover useful! Hopefully this book becomes widely accessible as this is one I really enjoyed. Well done Dave! 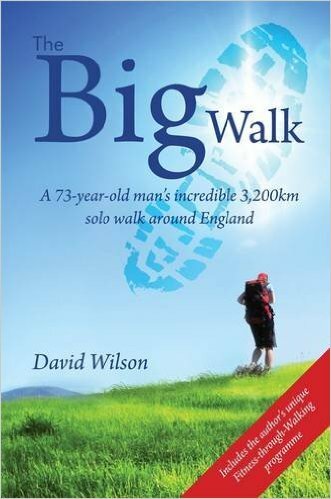 This entry was posted in Sports & Outdoors and tagged 200km Solo Walk Around England, The Big Walk: A 73-Year-Old Man's Incredible 3.